This section of the website is to be devoted to the ability of the Zwartbles breed, whether as sire or dam, to be an effective variety to use for cross breeding. Most of the cross breeding carried out at present uses the females because of their outstanding maternal qualities. The colour markings in this case are not important but it is the quality of the animal in terms of its conformation in order to produce lambs able to reach killing weights as soon as possible with a carcase grading of R3L. The Zwartbles ram as a sire has not been extensively used but does have some qualities that could be used to good effect on certain varieties. There is sometimes a problem with lambing some continental varieties because of their skeletal structure. 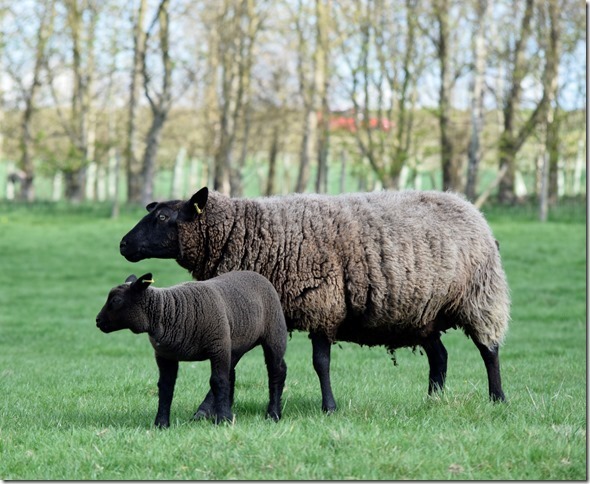 The shape of the Zwartbles with a longer neck and narrower shoulders allows a much easier lambing for those varieties that might otherwise struggle to deliver their lambs without assistance. Zwartbles rams have been used on texel gimmers to good effect on their first lambing with the resulting females having the option of selling into the fat trade or selling on as breeding females where the black Zwartbles cross females will produce white lambs with a suitable terminal sire. There is some evidence that the NCC cross is proving itself in the Highlands and a definite interest in testing a Welsh Mountain cross. 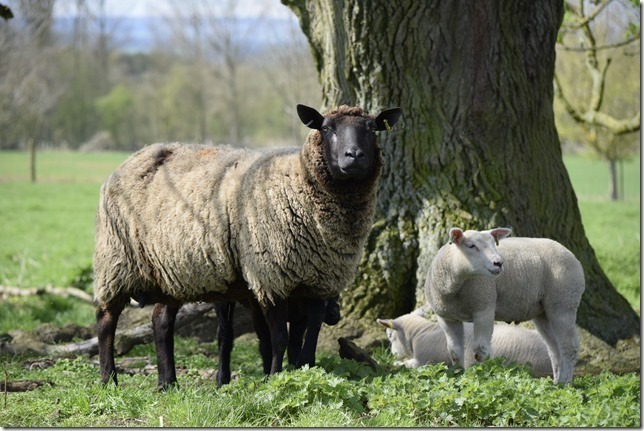 We need to have more than anecdotal evidence to promote this very important side of our sheep production and would like to hear from members with any information on cross breeding –crosses, lamb numbers, quality etc. and most importantly photographs so that we can add this to the website and end up with a useful resource for members who may be contemplating trying out some crossing for themselves. A Crossbreeding System using Zwartbles Ewes. Stephen and Nicola Hodgson live at Northfield Farm in Patrick Brompton, nr. Bedale in Yorkshire. Nicola works fulltime at Cargills, an animal feed company near Thirsk and Stephen is a relief cowman milking 240 cows about five miles from home. They have always kept sheep and Stephen has bred Charollais sheep for a number of years with the aim of producing a pen of shearling rams for sale at Kelso each year and an odd ram lamb for sale at Carlisle. He has always been interested in fat lamb production producing tight skinned, early finishing lambs that hit the ideal specification. They rent their farm but have also purchased some land and currently have planning permission for a new shed as their inside shed space at home is limited. They purchased their original two zwartbles ewes from the Garris flock of Joan Rowlands and with various additions now run a closed flock with the best ten ewes bred pure and the remainder put to a charollais ram. Stephen still keeps about thirty charollais ewes to breed pure and all the pure breds are artificially inseminated to lamb in early December. Results for the purebreds this year are 175% for the charollais and 200% for the zwartbles. The crossbred lambing this year started on 5th March. The rams used are a charollais and a beltex. The forty zwartbles ewes are put to the charollais and the twenty charollais x zwartbles ewes are put to the beltex for one cycle and followed with the charollais. The scan for this year’s crossbreds was 192%. The estate that Stephen used to work for as cowman is changing its policy and doing away with the milking herd and there is the opportunity of renting a substantial amount of grazing. Stephen would like to increase his crossbreeding flock to two hundred and take on the extra grazing land. At present he is keeping all his charollais x Zwartbles gimmer lambs to increase the flock. Next year with the change of lamb registration date Stephen and Nicola plan to lamb the purebreds in January, the charollais/zwartbles to the beltex ram in March and the zwartbles to the charollais ram in April. The finishing plan is to try to get all the March or earlier lambs away by the end of July leaving the charollais/zwartbles wethers to finish later. One possible solution being looked at is to feed stubble turnips and sell the finished lambs at the local Leyburn auction later in the year depending on the trade. Stephen has found the charollais / zwartbles is fast growing and finishes off grass. He has sent these lambs on a deadweight scheme which has a specification of a 21 kg. carcass. He is also part of a beltex scheme where beltex sired U3R/U3L carcasses within spec. pay a premium of £5 per head. Examples of prices last year (2017) in June were ---- U3L carcase @ 20kg. paid £4.85 per kg. giving £97.00 and a U3L @19.5kg. paid £94.57. As the year moves on the prices start to drop away, however in August a U3L @ 19.5kg still made £84.00. Even with her full-time work and checking the sheep while Stephen is milking Nicola still enjoys showing pure zwartbles and will again be showing at the Great Yorkshire Show and several local shows. As circumstances change Stephen and Nicola are looking to the future and adapting their system to fit in with the new opportunities as they develop. My thanks go to Stephen and Nicola for being such genial hosts and taking time to show us around. I would also like to thank Peter and Susan Addison for travelling down on the day – Peter as the driver and navigator and Susan for her patience in following sheep and lambs in a 20-acre field to try to obtain some photographs -definitely not an easy task. In order to create a larger market for our lovely breed, we have to show the world that the Zwartbles is a performance breeding ewe. We all know it is milky, has lots of lambs and that they are brilliant mothers, but we need to quantify this in order to show the commercial farmer exactly how milky, fast growing and prolific they are. 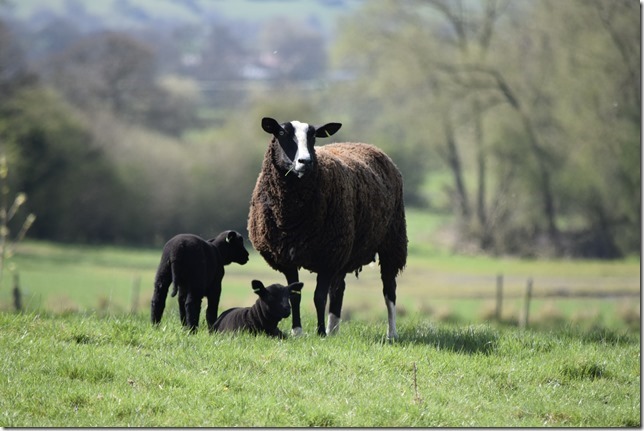 I have been experimenting for 11 years with Zwartbles as a commercial breed, both as a pure-bred and as a cross-bred ewe and have been monitoring performance of lamb growth, lambing percentage and carcase grading, which are the most important factors when considering commercial viability. I have found that on my farm, the Zwartbles and Zwartbles cross ewes are the best performing sheep when compared to my flock of Suffolk and Border Leicester cross ewes. I also have run a smaller number of Texel, Mule and Dorset ewes and the same can be said comparing with these breeds. My crossbred flock is currently made up of mainly Zwartbles X Texel and Suffolk cross ewes. In 2011, I used a Roussin ram as an easy-lambing terminal sire. My farm is 125 acres of very heavy clay ‘culm’ grassland at about 500 ft above sea level and is within the LFA boundary. It is run on an extensive basis, with very few inputs (fertiliser, sprays etc), but the climate is ideal for grass growth and there is always plenty of grass in front of the sheep. In 2011, all ewes were sponged and lambed from the 3rd week in January (pedigrees), and the commercial sheep from mid February. All lambs were killed as sucked lambs from early May to mid June (the time of year for the highest prices) averaging over £100 each. From 2 weeks old, the lambs had access to 250g of lamb creep each per day. Most of the triplets were reared on their mothers, and did not have any different treatment to the rest. The few tame purebred lambs I did have, did not perform as well as the triplets left on their mothers and account for all of the less desirable gradings shown in the chart. Crossbred tame lambs did not grade any differently to the rest. I sell all my lambs direct to the abattoir, which allows me to get carcase weights and grading reports for each individual lamb. The target grading for a lamb using the EUROP grading system is an E, U or R conformation grade and either a 2 or 3L fat grade. You get deductions for being outside of these target grades so commercial farmers aim to get all their lambs within them. Also, the abattoir will only pay on a carcase up to 21kg in weight so you do not get paid any extra for a carcase over 21kg. From the table you will see that the vast majority of my lambs grade ideally for the market requirement and weigh just about right. Based on my performance figures, the Zwartbles and first cross Zwartbles ewe would be amongst the highest performing ewes in the country, making it a truly commercial ewe to compete with the Mule, Lleyn and Border Leicester breeds. Commercial farmers buy thousands upon thousands of these breeds every year, so there is plenty of scope for the Zwartbles to take up some of their market share. The Commercial Sheep judge at the Royal Cornwall Show 2011, who placed my first cross Zwartbles ewe and her twin Roussin lambs as Commercial Sheep Champions, confirmed this. They beat over 30 other competitors, mostly Texel and Beltex. The judge was particularly impressed with the evenness of the lambs, their growth rate (45kg each), the size of the ewe and that she had obviously produced exceptionally good milk. However, these are just my flock results. To be able to promote the breed using unbiased statistics, more flocks and more statistics are needed. If more members can be persuaded to performance record their sheep, we would be able to use the information in the ZSA promotional material giving us more credibility with the commercial sector. This in turn should increase the demand for our sheep – both ewes and rams - and in so doing, increase their value, benefiting us all. After all, the Zwartbles is not just a pretty sheep!! Please send any information to ‘webmaster@zwartbles.org’ -Remember this is your website and is only as good as the information supplied by you.